We had the great pleasure to host celebrity chef, Neven Maguire to our shop and farm in Clonmel for his new TV series in association with Bord Bia, Nevens Irish Food Trails. In this new series Neven meets a collection of fascinating chefs, craftsmen and food producers who understand the importance of sustainability – Origin Green. During this episode Neven met with Alistair in Clonmel and Butchery Academy students Sarah and Anthony. 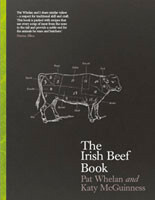 He also learned how our award-winning Beef Dripping is made with Trish and visited our farm with Pat Whelan. Neven’s Irish Food Trails airs every Wednesday on RTE 1 at 7.30pm and is also available on the RTE iplayer.